Today only save 25% on Thrive Natural High-Performance Skincare Kits. 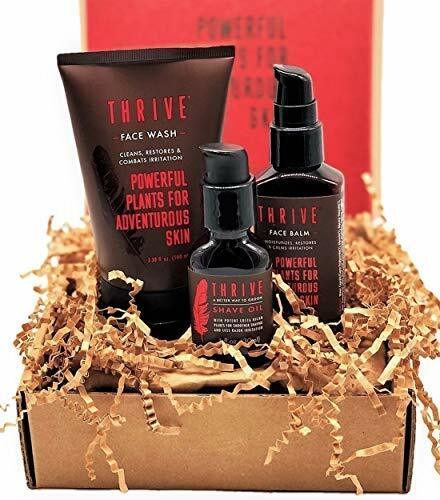 One favorite is this Thrive Natural Shave & Restore Men’s Grooming Kit with Natural Shave Oil & Aftershave Moisturizing Face Lotion for $18.72 (Retail $24.96). Thrive puts the strength of traditional botanicals from Costa Rica into a powerful natural grooming experience. These active ingredients are unique to Thrive’s products. And they’re more effective than the synthetic chemicals found in most skincare products. Juanilama herb: Independent studies have shown juanilama has anti-bacterial, anti-fungal and anti-oxidant (87% more than vitamin E) properties that help combat razor burn and ingrown hairs, blemishes, acne, and the impacts of stress and pollution on the skin. * Used by indigenous peoples to soothe irritation, skin abrasions, and a wide range of other skin conditions. Fierrillo vine: Independent studies have shown it to have anti-bacterial, anti-inflammatory, skin healing, and antioxidant properties that help promote healthier skin after shaving, exercise, outdoor adventures, stress, or combatting the effects of pollution. * This rainforest vine has been used by indigenous Costa Ricans for hundreds of years to help protect and heal their skin.